Last year the highly-publicized and controversial book about French parenting practices, Bringing Up Bebe, got many folks thinking about the way Americans value (or don’t value) patience. We tell our children that “patience is a virtue” but like so many things American, there is an ocean of contradiction surrounding this thought. Our culture is a pusher of instant gratification. We shop online for things we don’t want to wait to buy at a store. We receive calls in our cars because we don’t want to wait until we get home to talk. And no aspect of our lives has been changed by our instant culture more than eating. America is the birthplace of “fast food”–both the technologies and the philosophy. We don’t like spending hours preparing a meal…heck, we don’t even want to wait more than 20 minutes at a restaurant for someone to prepare it for us! America is fast. And America is fat. And in grandly ironic American style, we want to lose the fat, quickly! By now you have probably sensed the paradox. If you watch television with any regularity, it’s hard to ignore. Compelling commercials for McDonald’s and Jack-in-the-Box, purporting an easy family meal for a great price without ever getting out of your car… followed by Jennifer Hudson singing the virtues of Weight Watchers and a “doctor” recommending Hydroxycut. Throw in the government-sponsored billboards encouraging families to eat more fruits and vegetables next to government-subsidized-corn-syrup-laced convenience stores, and it’s the perfect storm of contradictions. Our food insanity is a pervasive Matrix. Waking up from it is scary and unsettling, but it’s the only way to be free. 1. BMI (body mass index) does not always determine accurately whether or not your weight is healthy. BMI has been the standard measure used by medical professionals to categorize folks into healthy weight, overweight, and obese, but as a simple ratio of height to weight it just doesn’t reflect enough of the diversity and complexity in humans. The fact is there are bigger folks who eat very healthily, exercise often and easily, and look undeniably hot. Some folks are just better at being bigger–physically AND psychologically. In my opinion, these folks should not be bothered with trying to lose weight to fit someone else’s idea of what healthy looks like. And thin people who don’t live a healthy lifestyle can be at risk for all the same chronic health problems we associate with the overweight. But having said all that, there are millions of people who are carrying around extra weight that is negatively impacting their health, so lifestyle changes that help them eat well and be more active could drastically improve their quality and quantity of life. Agreed? Let’s move on. 2. Losing weight is not beneficial to your health if it’s quickly gained back. 3. Getting to and maintaining a healthy weight is difficult physically and MENTALLY! Living at a healthy weight means you as a person have to change. If that doesn’t scare you, you probably haven’t had to change much in your life. Real change is frightening, painful, exhausting… It’s also the path to a more wonderful life. Just ask any parent, graduate, or expatriate. But there’s no reason not to use every strategy available to help you stick to the change. I’ve found several “rules” over the years that make maintaining a healthy weight easier for me. For starters, I don’t emphasize portion control. I like to eat, and I like to eat as much as I want, when I want. So instead of limiting my portions, I have very clearly defined guidelines for what I will and won’t eat. Quitting all sweets has been a great weight-loss strategy for me, because I can just have seconds of dinner when everyone else is having dessert. I also feel very strongly that NO ONE should be limiting their fruit and vegetable intake for any diet. Yes, fruits and vegetables are mostly carbohydrate. Yes, fruits have a lot of (fruit) sugar. But they are way too good for all the systems in your body to be avoided for any reason. When all of your organs are working better and healthier you will burn more calories, so keep the super produce in your diet in as large amounts as you can. And my most important healthy eating rule is to focus on the positive. Don’t think about what you can’t have, find healthy things that you love to eat, buy and cook lots of them, keep them with you when you leave the house…when you have delicious, healthy food around you all the time it is SO easy to keep eating well! So now you have the secrets to losing weight, right? Well, it’s kind of a trick question. Because the real secret is that there is no one secret. The secret to YOUR healthy size is in you–in your history (genes and childhood eating habits), your psychology (the mental and emotional relationship you’ve developed with food and fitness), and in your hobbies (what you find fun and are drawn to do over and over again). In order to lose weight and MAINTAIN that loss, you have to truly enjoy the daily life which gives you that result. Making the serious decision to change your weight is a huge first step, especially if you really commit yourself to it. But the decision alone won’t get you to your goal. True change is a slow, incremental process that will either wear you down until you give up and revert to your old self, or quietly strengthen your resolve until you reach actualization as a healthier, happier, stronger version of yourself. How it ends is all about how well you can WAIT. Will my refusal to limit produce or portions make me pop-star thin anytime soon? Probably not. But it will save me from the ups and downs of crash diets and the negative internal dialogue that inevitably accompanies them. Someone who adopts a similar lifestyle is not going to see the scale numbers plummet each week, but over the course of a year their weight would most certainly reach a healthier level. The struggle between instant gratification and long-term goals is not a zero-sum game. It is possible to feed your need for short-term enjoyment while also supporting a new lifestyle. In fact, it’s likely that acknowledging and attending to short-term desires is the only way to stay on track to your bigger goals. Humans are emotional beings, whether we like it or not. Making the decision to change some aspect of our lives is enough of a shake-up, so really sticking to a plan requires the sensitive handling of our feelings. For any delayed-gratification goal, from weight loss to getting a college degree, some of the following strategies can help manage the emotional challenge of change. Celebrate small victories. If you are attempting weight loss through reasonable lifestyle changes, you will likely not see huge leaps forward to your goal. Remember, good progress is slow progress; but it is PROGRESS! So celebrate it. 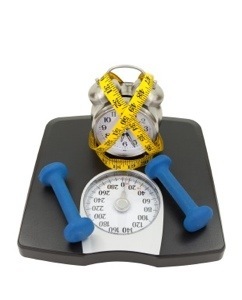 Weigh or measure yourself every couple of weeks and visualize success for the next check-in. Don’t expect to be buying a new clothing size right away, but appreciate yourself for the hard work you are doing. Accept applause. Tell people about the changes you’re making so you have a supportive audience, and then keep them in the loop as you move forward. They will probably notice improvements even more easily than you notice them yourself. They may even join you by making a positive change in their own life! “Cheat” without giving up. Typically folks making a change in the way they live feel great about it at the beginning, and then start to break down. The old ways start to sound appealing again, and since their goal is long-term, it fails to motivate them enough in the moment. As good as the old ways may sound, the reality is that they aren’t really all that great. If they were, you wouldn’t have decided to change them! But sometimes a reminder is in order. Set a date to live the old way for ONE DAY. Then write down how you feel throughout that day. I’m willing to bet that the junk food doesn’t taste as good as you remember and you miss the clean feeling (you didn’t realize you had) when the chemicals kick in and your healthy edge starts to dull.